Tag Archives for " Facebook call to action buttons "
Facebook recently added a feature that may help click throughs on Facebook page posts. With just a little bit of extra work you can now add native call to action buttons to your organic Facebook page updates. Initial testing suggests this can greatly improve clicks. The post below features a call to action for a webinar, but this type of post would be equally effective for newsletter signup or even as a buy button for a product or service. The call to action buttons are also available to Facebook advertisers, but the fact that they have made them available for any status update is what interests me here. 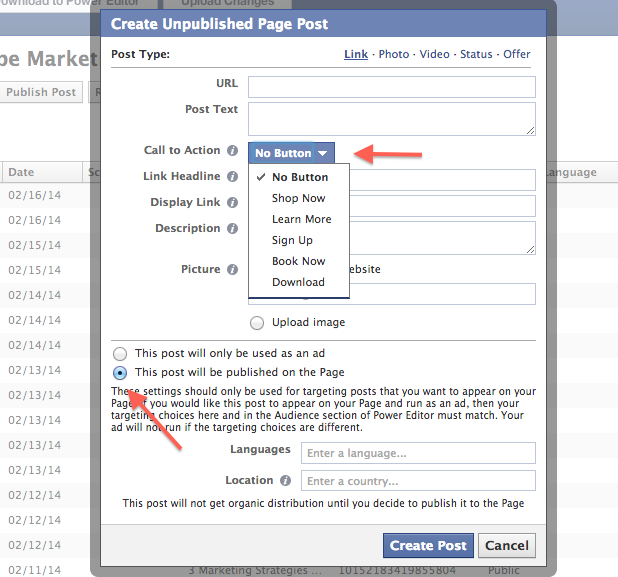 The only tricky part for some is that you must install and operate a Facebook advertising tool called the Power Editor. 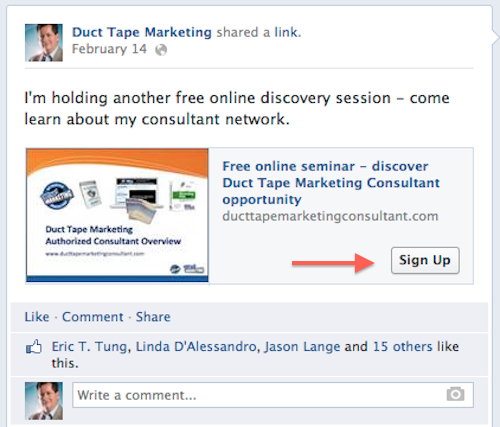 Veteran Facebook ad pros will be familiar with this useful tool, but many who simply want to do what I am outlining in this post may not. The Power Editor only works in the Google Chrome browser so you’ll need that as well. To access and manage the Power Editor go here. You can also get some instruction on using the Power Editor here. You will have the option then to create your post text as well as the link for the call to action, add the call to action button from a drop down list, description, photo and display headline and link. You will also want to select the display as post button at bottom. Once you are satisfied with your post (you’ll have the option to preview it on your page), you must choose publish post (you can choose to publish now or schedule a publish date and time in the future). Once you do this you must also choose Upload Changes from the green button at the very top of the editor. This isn’t a major change for Facebook but I do believe it’s a useful one for those promoting any call to action. For the moment, the native Facebook call to action button has a lot of appeal.